Announcements & media coverage pertaining to the Wasteland series. 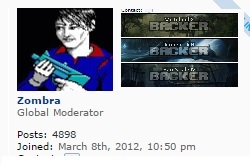 Only moderators & inXile can make new threads on this forum. Today we have a small gift for all our Wasteland 2 backers. Everyone who has backed and receives Wasteland 2 with their pledge reward also receives an exclusive Wasteland 2 backer forum badge! To get your forum badge, please log in with your Wasteland 2 backer account (https://wasteland.inxile-entertainment.com/user/private), then visit the Rewards page and click the "Badge" tab that appears on the Rewards page (https://wasteland.inxile-entertainment. ... te/rewards). You'll then be prompted to select your forum account email and be given a special key. Use that key on the forum page as indicated, and you'll be able to proudly display your Wasteland 2 forum badge on your forum posts! Remember that you will need to have your forum account email linked to your Wasteland 2 backer account for the key to work, since the key is tied to your forum email address - you can link up your email as needed by visiting the Email Addresses page of the Wasteland 2 backer site. This comes on request from our forum community, and since we had already built the tech for The Bard's Tale IV, it made sense to roll out to our other games. Enjoy! The badges could do being a little smaller, they're a bit indulgent as is. Crosmando wrote: The badges could do being a little smaller, they're a bit indulgent as is. Don't be surprised if they do change at some point in the future. Also they are being hidden on small screens now [you might need to hard refresh your browser]. make them smaller, same width as portraits ? What if I got torment through backing Bard's Tale IV do I get a badge for it, or just for Bards Tale IV i'm guessing? Acid wrote: What if I got torment through backing Bard's Tale IV do I get a badge for it, or just for Bards Tale IV i'm guessing? Just BTIV, the same applied to me with WL2, I got WL2 through my pledge on Torment, so I'm not officially a backer of WL2. Great, just found out about these badges!